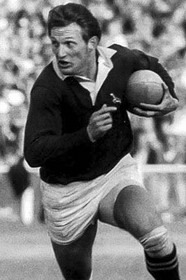 I saw Gert Muller at the second Craven week in 1965. Natal had a brilliant schoolboy team and I spotted another Springbok there, Andy van der Watt. Both came to Stellenbosch but rumours that I had specifically asked Andy to come to Maties were untrue. Like Ray Mordt years later, Gert was tremendously strong on the run. Young Andries took the hint. That was Gert's entire outlook on life - as far as he was concerned no-one could stop him; nothing was impossible if he wanted to do it. I would very much like to see what is going to happen to his offspring as his wife, Letitia, was also a fine Springbok athlete. Sporting excellence will surely course strongly through the veins of their children.